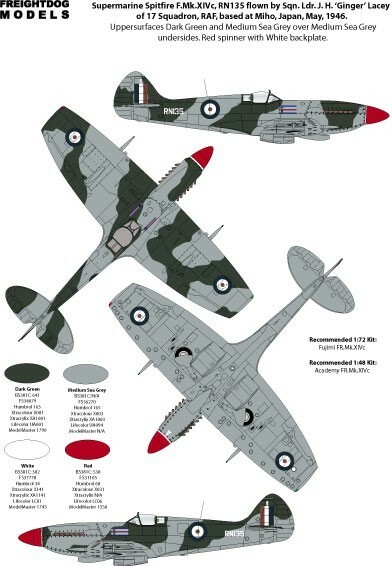 Catalogue Number: Freightdog Models FSD72-002S - Brits Abroad. 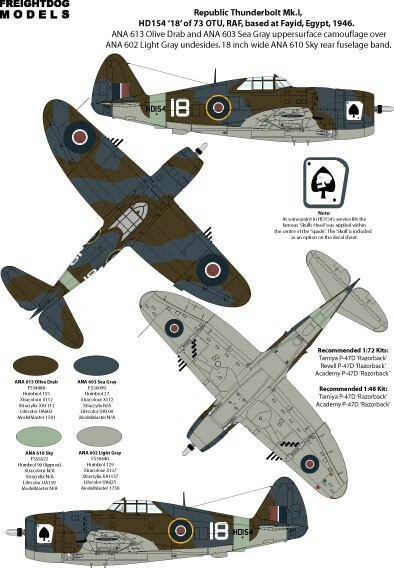 Contents and Media: One decal sheet measuring 156mm X 97mm plus a 12 page A5 sized instruction booklet with markings for 9 aircraft all in the usual Zip-lock bag. Advantages: Excellent printing by Fantasy Printshop. Wide range of interesting subjects. Disadvantages: Some of the colours in the instructions are a little on the dark side. Conclusion: This set looks like another name to add to that growing list of decal manufacturers that are bordering on perfection. 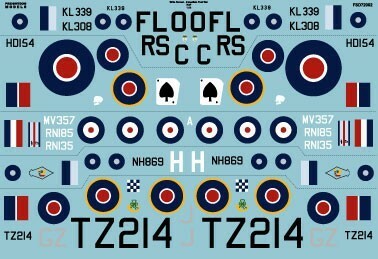 Freightdog Models is a British manufacturer and online retailer of decals and resin update sets. 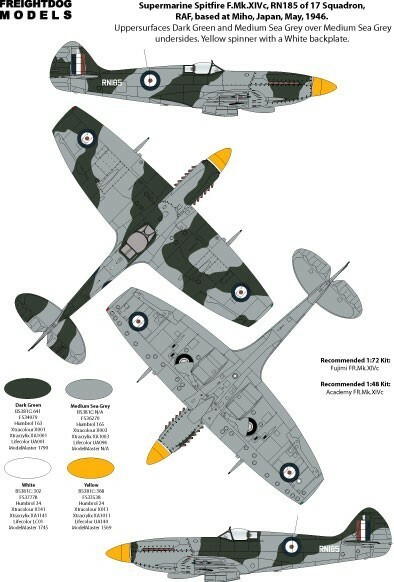 Their newest release is Brits Abroad – Immediate Post-War RAF. This comprises one sheet covering nine aircraft: one Thunderbolt Mk. I (Razorback), two Thunderbolt Mk. 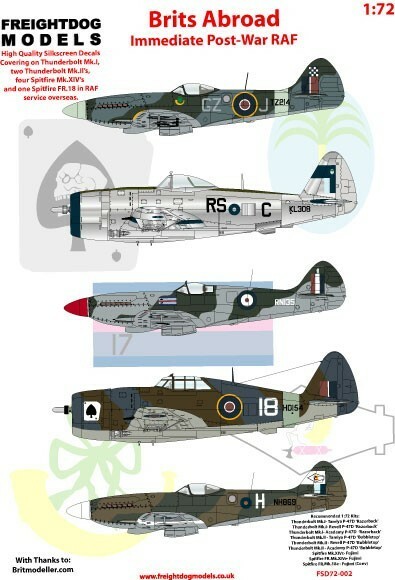 II's, four Spitfire Mk. XIV's, one FR 18 and a lone Mk. IX. Spitfire FR. Mk. XIVE, MV357 of 11 Squadron, RAF, at Miho, Japan in May 1946. It's in Medium Sea Grey/Dark Green above and Natural Metal below with no codes and a NM spinner. Thunderbolt Mk. II, KL339, FL-O of 81 Squadron, RAF, based at Kemajoram, Java in 1946. This aircraft is in overall NM with OD anti-glare panels front and back, Dark Blue front of Cowl with the same colour stripe on the fin plus upper and lower wing surfaces. Small SEAC roundels in six positions plus fin flash and codes in black. 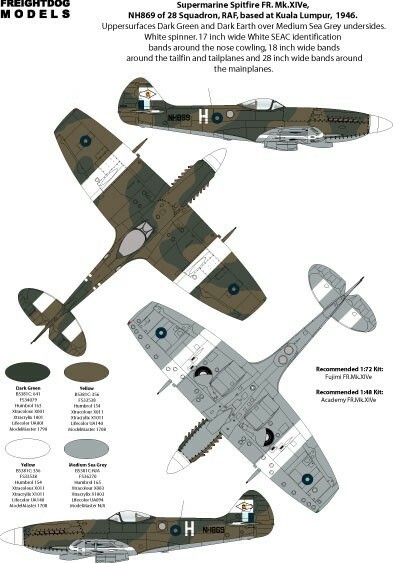 Next is Spitfire F. Mk. XIVE, RN185 of 17 Squadron, RAF, at Miho, Japan, May 1946. It is in the same upper colours as the first aircraft but with MSG beneath, no codes and a yellow spinner. Another Thunderbolt Mk. II, KL308, RS-C of 30 Squadron, RAF, at Baigatchi, India 1945. This one has the same colour scheme as the Thunderbolt above. This time a Razorback Thunderbolt Mk. I, HD154, '18', of 73 OTU, RAF, at Fayid, Egypt 1946. It's in ANA 613 OD/ ANA 603 Sea Grey above and ANA 602 Light Grey below, 18 inch ANA 610 Sky Fuselage band, white 18 in front of the band plus an “Ace of spades” card on either side of the cowling. Sqn. Ldr. Ginger Lacey's Spitfire F. Mk. XIVE, RN135, of 17 Squadron, RAF, at Miho, Japan, May 1946. 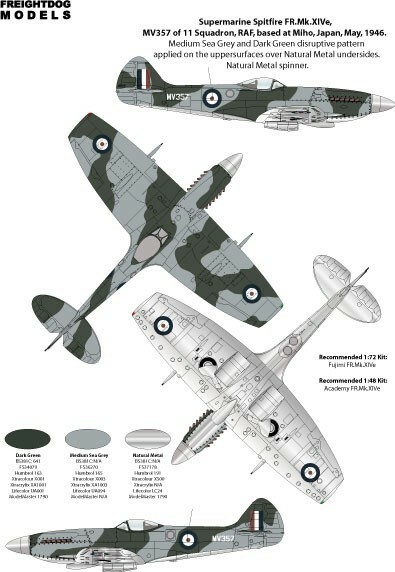 In an identical scheme as the second Spitfire above but with a red spinner and rank marking on either side in front of the windscreen. These three Japanese based aircraft all have clipped wings and small post-war roundels with small red centres. 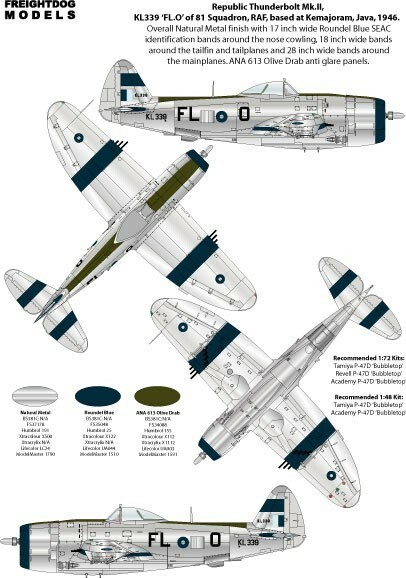 We then have a Spitfire FR. Mk.18e, TZ214, GZ-J, of 32 Squadron, RAF, Palestine, 1948. This aircraft is in Dark Green/ Ocean Grey over Medium Sea Grey with Sky type “S” band and spinner. The codes are in white with a B&W square check above the fin flash and an Irish emblem below the cockpit. 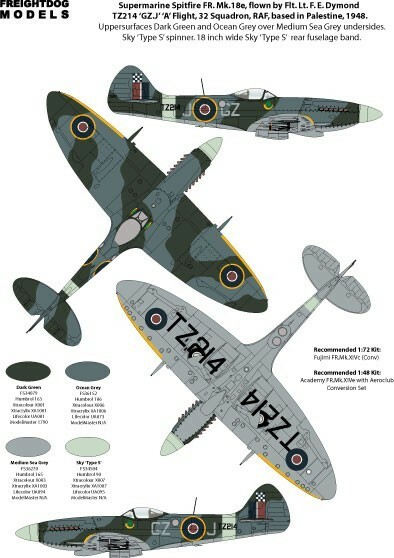 Roundels are the large late-war variety. Another FR. Mk. XIVE, NH869, “H” of 28 Squadron, RAF, Kuala Lumpur, 1946. This ones in the standard SEAC colours of Dark Green/Dark Earth over Medium Sea Grey with the small SEAC roundels and fin flash, 18 inch bands on the fin and tailplanes and 28 inch bands on the mainplanes plus a white spinner and letter “H”. Last of all is a lone Mk. IX C, MH448, AP-P, 'Kjevik Follys' of 130 Squadron, RAF, during 'Operation Opostle', Kjevik, Norway, 1945. This aircraft is in late war colours and roundels with sky Type “S” codes, band and spinner. The outer cannon stubs have been removed and faired over and the name is in yellow under the port exhausts. This is a great collection of post war RAF aircraft in various locations with various schemes with markings that, on the sheet at least, look superb.